This product will be set-up, tested and ready to use. It will be delivered at a time to suit you. Start N Go is exclusive to Just Lawnmowers. Find out more. FREE DELIVERYSTART 'N' GOSome postcodes excluded. Check postcode. Why buy from Just Lawnmowers? The brand new Mini S500 garden trailer from Just Load 'n' Go is absolutely packed full of fantastic features, making it an ideal choice for those in need of a high quality trailer with an ideal 227 kg (500 lbs) load capacity. 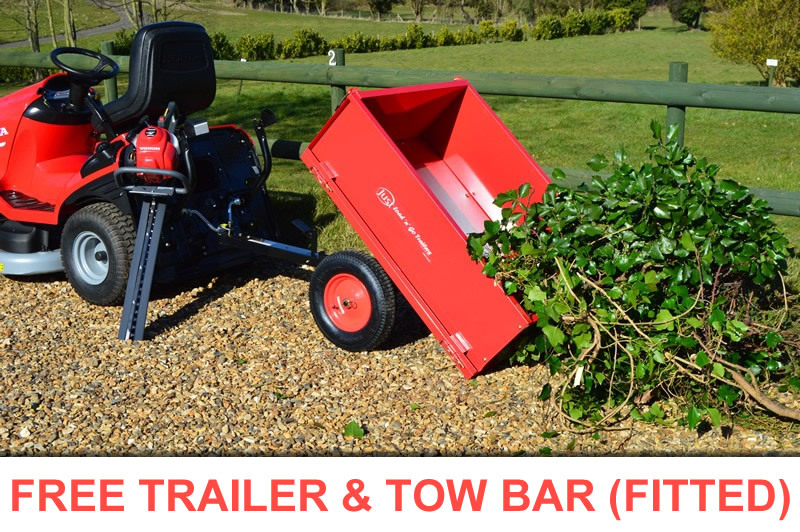 This trailer is incredibly efficient and has a new, ultra easy assemble design that reduces installation time compared with any other trailer on the market to date. This trailer is incredibly easy to assemble thanks to a new design that reduces installation time compared with any other trailer on the market to date. The Honda HF 2622 HME garden tractor is packed full of cutting-edge and innovative features that maximise cutting and collecting performance while ensuring a comfortable and relaxing ride. When it comes to collecting grass cuttings, airflow is critical. The new Honda HF2622HM lawn tractor features a new blade and cutter deck that incorporates twin fans to draw more air in; and at the back a smoother, wider rear chute and fluted mesh grass bag allow more air to flow through. This new "Optiflow" system results in more clippings been collected into the grass bag than ever before. Ergonomically designed controls offer new levels of comfort and safety with intuitive foot pedals, a high-back adjustable seat, easy access rear fuel filler and a full diagnostic LED dash. The electronic dash will inform you of grass bag levels, operator correctly seated, gear in neutral before starting engine, parking brake fully engaged and much more. If you have a large lawn or outside space, park or sports ground to look after, you’ll understand and appreciate the comfort, performance and extra cutting width that the Honda HF2622HM lawn tractor offers. This lawn tractor has smooth push-button blade engagement and hydrostatic drive which will help you cut large areas of of lawn with perfect results, at a pace that suits you. Honda's V-twin engines deliver the highest standards of smooth power and superior reliability, combined with premium features including automatic headlights (which switch on when it starts to gets dark) and audible grass-full indicator. Honda HF 2622 HME Garden Tractor features Honda's new Optiflow System. The key to good grass collecting performance is a powerful and controlled air flow. So Honda's Research and Development (R&D) team developed Optiflow, a system that combines powerful suction with controlled and low turbulence air flow that reduces power loss, noise and grass accumulation. With a single lever, Honda's Versamow™ selective mulching system will either collect the grass cuttings into the bag or finely shred and blow them down into the lawn to create a natural fertiliser. If your grass is long or rough, you can mow your garden and just collect grass clippings in the grass bag. But if your grass has grown only a little, or it has just rained and you still want to cut your lawn, you can select mulching, and by doing so fertilise your grass at the same time. Or, you can keep your grass tidy and collect the clippings in one area of the garden and with the simple push of a lever then do a rough cut in other areas of the garden. Whatever you decide, you can do it with the same machine, no mulching kit to add, nothing to bolt in. There are two kinds of cutter decks: one with asynchronous blades and one with synchronous blades. Cutter decks with asynchronous blades use two independent unsynchronised blades that are slightly offset. Cutter decks with synchronous blades use two blades that are synchronised with a timing belt to keep a constant 90 degree angle. The benefits of a synchronous system are a constant cutting performance to avoid uncut areas, even when turning and better air flow under the cutter deck resulting in optimised grass collecting and a lower risk of clogging. Optiflow - A fan-powered system under the cutter deck improves air flow between the cutter deck and the high air-flow grass bag, significantly improving collecting performance. Professional OHV engine - The engine is specifically designed for heavy and professional use. They are over-head valve (OHV) with extra features to cope with heavy use and include a cast iron sleeve, a bearing set supporting the crank shaft, high capacity air filter and steel fan cover. Anti-scalp rollers - Two front and two rear rollers prevent scalping of the ground while cutting. Honda Intelligent Monitoring System - A circuit board automatically checks and displays on the electronic dashboard all important safety parameters. The system will even turn on the lights for you automaticaly when it starts to get dark! Hydrostatic transmission - Allows you to cut grass at your own pace. Forward and reverse speed is fot controlled. The Honda HF 2622 HME garden tractor comes with a lengthy 5 year warranty (subject to annual service, and if used in a domestic environment). Honda ride-ons are supported with one of the longest and most comprehensive warranties in the industry. We follow Honda's extensive training programme with regular refresher courses, so you can trust in our valuable advice and experience to help you choose the product that's just right for you and your garden. We offer the highest levels of service and have factory trained technicians who will fully assemble and test many Honda machines that we sell online prior to dispatch. This includes a full Pre-Delivery Inspection (PDI) complying fully with Honda's strict guidelines. Please call us to confirm which machines receive this service. Start 'N' Go is exclusive to Calgary Just Companies websites. We know from experience that when our customers buy a new piece of garden machinery, they want it to work – straight out of the box. They don't want to spend time assembling it, adding oil and generally fiddling about – they just want to start using it as quickly as possible. They also want it delivered at a time to suit and them on a day to suit them. What is Start 'N' Go? "Excellent service, delivery date/time picked my me after being contacted by Palletways. A big thank you to them. Machine delivered on a small pallet and was very well packed. Once unpacked it was just a matter of unfolding the handle. Once a little fuel was added it fired up on first pull, I am now a big fan of Start N Go. All in all a very professional company to deal with. Many thanks to all the staff at Just Lawnmowers, you are doing a great job, a very refreshing change from other companies I have dealt with on line." Remember: Some machinery requires a lot of setting up before you can use it, so when it does, we offer Start ‘N’ Go. * Some products may be re-boxed for protection whilst in transit. Some products may also require the handles assembling (to avoid damage whilst in transit). Please note: Delivery is 5-7 working days for all Start N Go products (except Express Start N Go products which are 2 working days) as your machine will need to be assembled and tested before dispatch. Why buy your Honda from us?